Ignite your young students with a sense of wonder with hands-on engagement in early coding and STEAM concepts through Loopy’s quirky personality and codable expressions. 100+ Multi-Disciplinary STEAM, Robotics and Coding Lessons covering core science, math, social studies and language arts. Touch Sensor: Loopy knows when you grab him, rub his belly or tickle him. 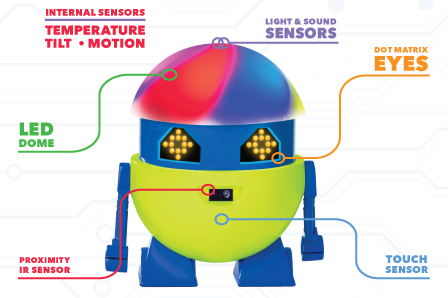 Proximity IR Sensor: Loopy can sense what’s nearby—or when you might be sneaking up on him! Light Sensor: If you turn out the lights, be careful—Loopy might get scared! He can also tell if the light gets too bright for his eyes. Temperature Sensor: Loopy loves to be at a comfortable temperature and will let you know if the room gets too hot or cold. Tilt Sensor: Loopy can feel if he’s being shaken, dropped, picked up, or tilted. Motion Sensor: Start walking with Loopy and he can sense when he’s on the go! Sound Sensor: Loopy can hear you clap or make a loud noise. If you turn out the lights, be careful—Loopy might get scared! He can also tell if the light gets too bright for his eyes. Loopy can feel if he’s being shaken, dropped, picked up, or tilted. Start walking with Loopy and he can sense when he’s on the go! Loopy can sense what’s nearby—or when you might be sneaking up on him! Loopy knows when you grab him, rub his belly or tickle him. Loopy loves to be at a comfortable temperature and will let you know if the room gets too hot or cold. My Loopy forms an engaging and interactive way to incorporate modern coding and robotics curriculum into the K-2 classroom. All the curriculum is offered through our website called the LocoRobo Academy. 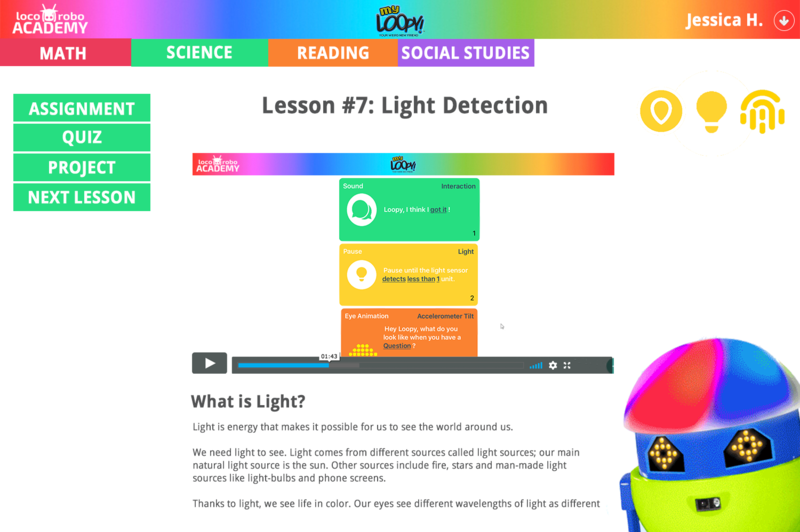 • Explore the science behind sensors, light and sound with Loopy's robotics technology. • Dive into core science and science application topics, fully aligned with the Next Generation Science Standards (NGSS) and state standards. • Lessons in Social Studies, Math and Reading. • Access full lesson plans and teaching guides with instructional videos, Q&A activities and printable worksheets.